After finishing the various parks yesterday we had a very pleasant evening meal in the Radisson Blu hotel in Chittagong, and though not particularly cheap I'd recommend the place as a haven of serenity amidst the craziness that is Bangladesh in general. The drive to the airport afterwards was quicker than we'd anticipated, and given that we asked the Novoair staff whether it might be possible to move to an earlier flight. Unfortunately all the earlier options were sold out, so we found somewhere to sit and spent a few hours making the most of the free wi-fi. 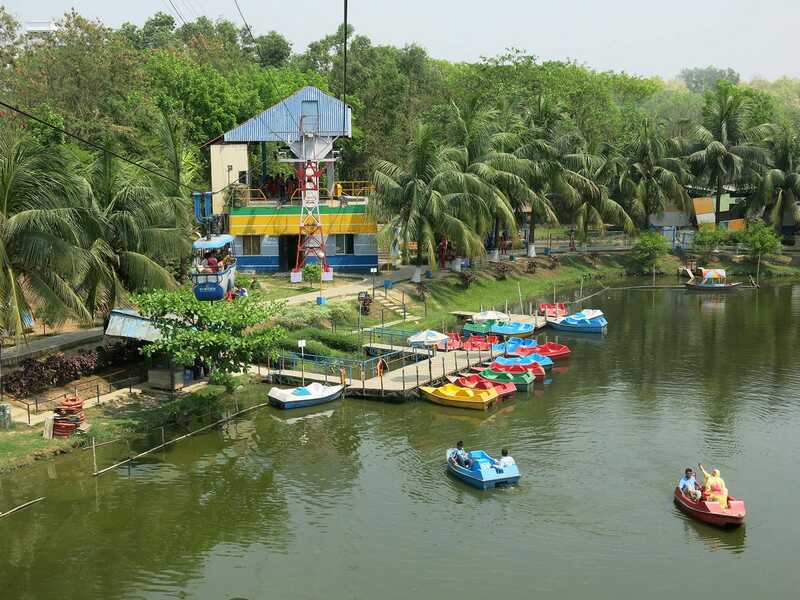 Nandan Park is located about thirty-five kilometres to the north-west of Dhaka Airport, which today represented about a two hour journey by road. The vast majority of that time was spent clearing the chaotic city traffic, and once we were out in the countryside the last few kilometres went very quickly. 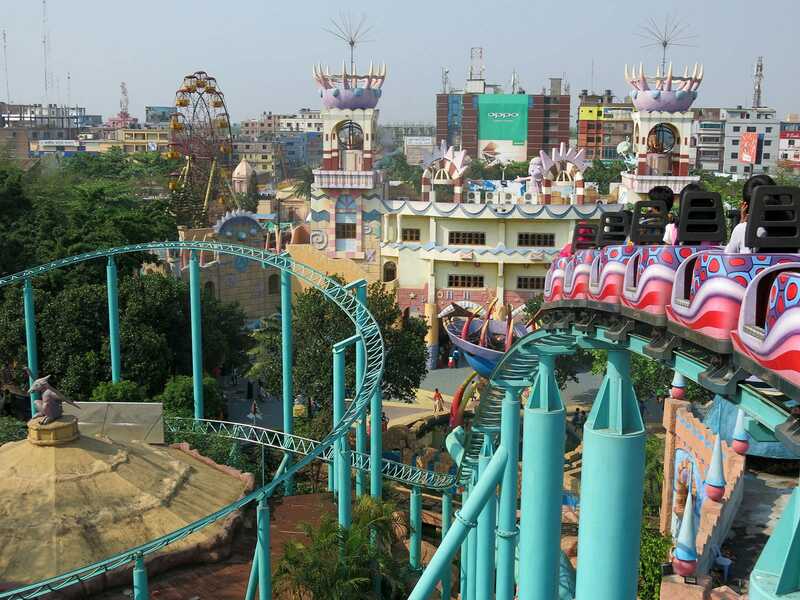 The best driving route is along the Ashulia Highway, which goes directly past the main entrances of Fantasy Kingdom and Heritage Park, and enthusiasts are unlikely to have any problem visiting all three locations in one day. The park is reasonably substantial and pleasantly landscaped. Around twenty percent of the space is occupied by a lake, with paddle boats and a cable car passing overhead. A small water park can be seen at the back of the grounds, with three slides and a wave pool, but today the majority of guests were working their way around the various dry rides. Distribution is virtually guaranteed by the fact that admission tickets (BDT 320, ~€3.50) include one ride on everything; repeats can be purchased inside the park if desired. Moon Raker (#2206) is a locally built Wacky Worm equivalent of standard size and shape, albeit without undulations on the upper level of track. A huge blue fiberglass sphere occupies the place of the usual apple, its asteroidal status apparently confirmed by the presence of numerous white stars. The upper level of the ride was a slow meander that woke up abruptly with the unbraked drop, which delivered powerful airtime coupled with a vicious slam to the side. On closer inspection it became apparent that this was due to a visible kink in the track that probably wasn't doing the wheel assemblies any favours. With the credit out of the way we began a methodical walk around the grounds to see what else might be available. One of our first discoveries was a retail store selling kitchen appliances, easily the strangest thing I've found inside a gated park, other enthusiasts notwithstanding. Rice cookers, saucepans, microwaves, toasters, and steam irons were all available to discerning customers. A second shop located nearby sold assorted trinkets, again not what I'd typically go to an amusement park for. After a while we ended up at the Cable Car, which featured pairs of two-seat cars coupled together. From the heights we had a birds eye view of an unusual sculpture of a sunbathing giant, whose crossed legs were sticking up from the ground roughly twenty feet away from a head and shoulders. The coaster was obscured behind trees unfortunately, but we did get some nice overview photographs. When our car returned to the boarding platform we were welcomed by a small group of locals who'd spotted us overhead and wanted their photographs with us, and it'd have been churlish to refuse. 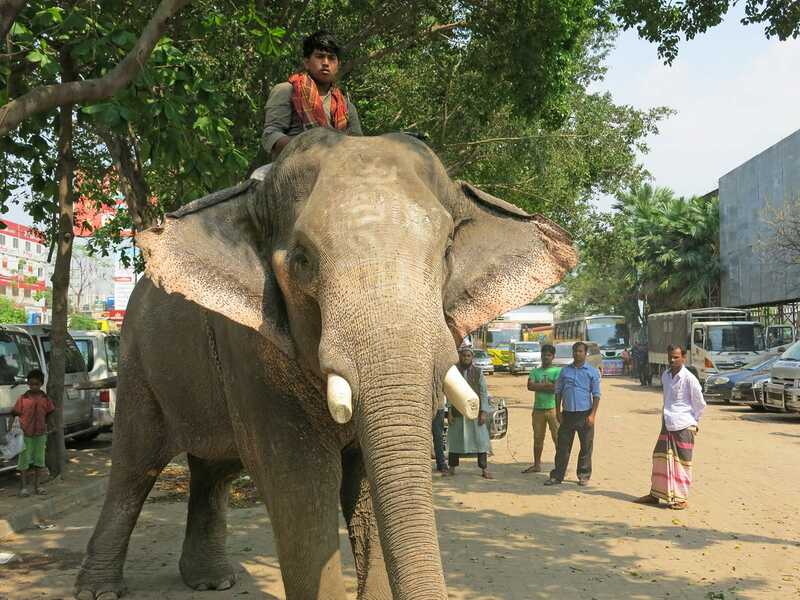 Our driver pulled into the tiny car park at the front of Fantasy Kingdom to a sight that is no doubt entirely normal in Bangladesh, but startling and awesome in equal measure to curious foreigners. Amidst the cars stood a mahout on the back of an elephant that was systematically pruning trees. Several security guards at ground level were holding chains presumably in an attempt to intervene should several tonnes of angry pachyderm go on a rampage, though how successful they would be is anyone's guess. The park gate leads into an enormous open space with a stage in one corner. Today about a third of it was filled with several hundred people dancing enthusiastically as a local band performed, their music accompanied by a thumping beat. We'd had our fill of Bangladeshi pop music earlier in the week, and thus walked straight to an enormous castle facade marking the entrance of the rides area. As we walked through we caught the first glimpse of our target coaster operating, but the happy sight was tempered almost immediately by the realisation that the place was extremely busy, with the queue for the coaster stretching almost half way across the park. We went to investigate whether there might be any VIP option available, and a ticket seller advised us that there was but that it would need to be bought at the information office. We dutifully headed there only to discover that this plan did not in fact include special access to rides; rather, it provided access to a relaxation room with refreshments, broadly akin to an airport lounge, complete with dedicated toilets. Though air conditioned comfort was certainly appealing, we could have had the same in our hotel at a lower price. There was nothing to be done except buy coaster tickets and join the back of the queue. I'm really not sure what happened next. We were queue jumped by an extended family with about twenty children and a few haggard looking adults. We responded by reclaiming our original space in line. Then the group who had skipped us in the first place decided they wanted their photographs taken with us (to which the response was an emphatic colourful metaphor). There was definite ill feeling in the air when a local woman came over to us and for no obvious reason escorted us to the front of the line, where a security guard allowed us to climb over the railing in front of everyone else who had been waiting. This saved us at least an hour and was much appreciated given the ambient temperature, though why it happened is anyone's guess. We were lucky enough to claim the back car for our ride on Roller Coaster (#2207), a custom designed Zierer Tivoli with a broadly rectangular layout spanning almost half a kilometre, making it the fourth longest ride of its type (after Pepsi Orange Streak, Jaguar, and Viktor Vandorm). The first drop descends around fifty feet at a moderate angle towards the front of the park, before turning sharply left into a forceful ascending helix that routes around the outside of one of the park restaurants. From that point onwards a series of gentle hills takes a route around other rides and through thick trees back to the boarding platform. Though not an aggressive thrill ride, the coaster scores major points for visual impact; I'd have loved to do more than one lap but the queue made it a practical impossibility. Despite the wonderful coaster, however, the park was too crowded to be fun; the sheer number of people in the place made things more than a little uncomfortable, and while the locals were not unfriendly, the constant requests for photographs became a little overwhelming after a while. After a few minutes of exploring we decided it'd be best to expedite our departure, and thus we completed a quick walk around for photographs before passing through a small gate into Heritage Park next door. Walking out of Fantasy Kingdom was like stepping from a rock concert into a library. Though the loud music from next door was still audible, it quickly began to fade as we moved further inside a park that was to all intents and purposes a smaller version of Shadhinota Park. The grounds contained a number of model buildings and half a dozen children's rides, and today they were virtually empty, in sharp contrast to the larger park next door. Heritage Park is home to Mini Flume, a water coaster featuring a four person car and an oval shaped layout comprised of lift on one side and a splash and climb out on the other. Unfortunately it was closed today due to a water supply issue, but this wasn't a particularly major loss, given a ride design that is often utterly drenching. We'd actually taken the decision to skip over a very similar coaster elsewhere in our trip due to difficulties with opening hours, reasoning that travelling a long way for a somewhat questionable credit we didn't particularly want to ride was not a good use of time. (As an aside, long time readers might want to bear in mind that it's a lot harder to be an unapologetic CreHo when there's a woman in your life moderating the more extreme trip plans; extended drives are only permitted on special occasions). The only attraction we decided to ride was Family Roller Coaster (#2208), an undistinguished SBF Rides Wacky Worm. We were given two laps, and heavy braking on the drop meant that both were equally uninspired. Our driver didn't know where Fantasy Island was, but he was able to get us to the general area and my GPS got us the rest of the way. The park was located at the end of a dirt track road, and given that we didn't expect a whole lot. 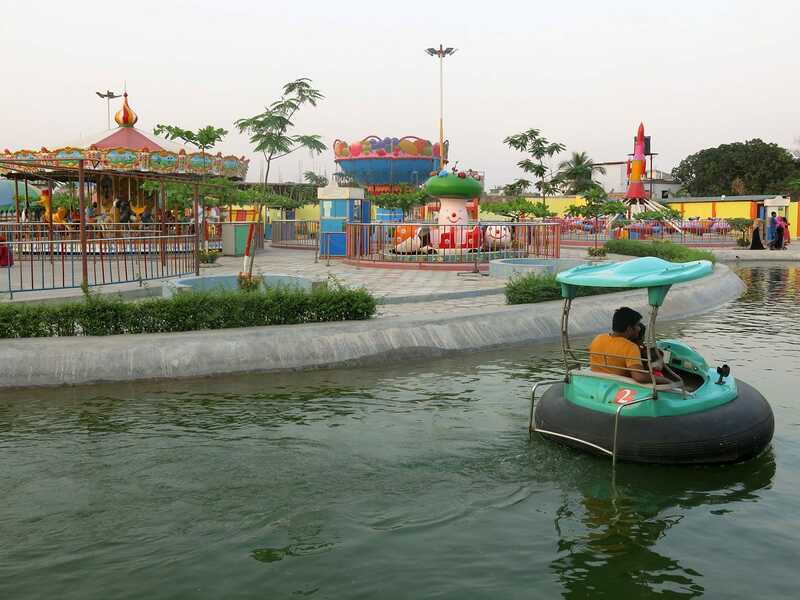 It was therefore an enormous surprise to discover a small but beautiful park set around an artificial lake, filled with brightly coloured rides that were all spotlessly clean. All the hardware appeared to have been supplied by Chinese companies, and included bumper boats, bumper cars, a rockin' tug clone with a car theme, a frog hopper, a carousel, a pirate ship, an octopus, and a non-lifting paratrooper. The powered Caterpillar Coaster was a very energetic little thing that moved far faster than its diminutive dimensions would have suggested. Every turn was forceful but not uncomfortable in any way. Rather than have braking, the stop was achieved by the simple expedient of turning the power off at the half way point, allowing the train to coast back into the station at low speed (and no, that doesn't make it a credit). The highlight for us was in the skies above the park, as we were in the flightpath for Hazrat Shahjalal International Airport. Over the course of twenty minutes we photographed a Novoair ERJ, a US-Bangla Q400, a Biman 777, and a Saudi A340 and we'd have spent longer indulging our inner nerds if the daylight hadn't begun to fade. Aerosexual enthusiasts are encouraged to time their visits around peak flight times for maximum enjoyment!